Cobalt administration in the human body is a risk factor for developing pulmonary and cardiovascular health problems. In this paper we report the results of functional studies and biochemical mechanisms of endothelial dysfunction and pathology of internal organs in cobalt intoxication in experiment. System-organ nature of the activation of oxidative processes is identified according to the increase of MDA secondary product in erythrocytes and homogenates of internal organs as well as the participation of AOC imbalance in the development of lipid peroxidation, the peculiarities of the violations of NO release endothelial function and participation in this process of L-arginine and an analogue of endogenous inhibitor of expression eNOS -L–NC - arginine methyl ester (L-NAME or L-nitro-arginine-methilester) with cobalt intoxication in conditions of activation of oxidative processes. Chronic cobalt intoxication in rats leads to the activation of oxidative processes, thus there is inhibition of superoxide dismutase activity and the concentration of catalase and ceruloplasmin increased. Cholesterol metabolism is disturbed, as well as impaired nitric oxide production and its bioavailability, which is accompanied by the change of the microcirculatory hemodynamics of the visceral organs. The evaluation of the internal organs’ functional state according to the activity of the Na+,K+-ATPase in homogenates is performed, as well as due to the activity of organ-specific and excretory enzymes in blood serum on the background of cobalt toxicity. The role of changes of cholesterol metabolism is established – as a risk factor of atherogenesis in violation of the bioavailability of nitric oxide. For the pathogenetic correction of violations we applied the method using the endogenous antioxidant coenzyme Q10 and regulators of the expression eNOS L-arginine, L-NAME and their combination with coenzyme Q10. Bondarenko L.V. Geneticheskaja toksikologija [Genetic toxicology]. Jekologicheskaja genetika, 2007, vol. 5, no. 1, pp. 39–41 (in Russian). Gorjunov I.A., Dzhioev I.G. Osobennosti sostojanija perekisnogo okislenija lipidov i antioksidantnoj aktiv-nosti pri respiratornom distress-sindrome u novorozhdennyh [Features of the state of lipid peroxidation and antioxidant activity at respiratory distress syndrome in newborns]. Materialy mezhdunarodnoj nauchno–prakticheskoj konferencii - Razvitie proizvodstvennoj i jekologicheskoj bezopasnosti v 21 veke. Problemy i reshenija, Sankt-Peterburg – Vladikavkaz, 2009, pp. 208–211(in Russian). Kamyshnikov V.S. Opredelenie soderzhanija (aktivnosti) ceruloplazmina [Determination of contents (ac-tivity) of ceruloplasmin]. Spravochnik po kliniko-biohimicheskoj laboratornoj diagnostike, Minsk, 2003, vol. 2, pp. 71–79 (in Russian). Korolyuk, M.A., Ivanova L.I., Mayorova I.G., Tokarev V.C. Metod opredelenija katalazy [Method for catalase determination]. Laboratornoe delo, 1988, no. 1, pp. 16–19 (in Russian). 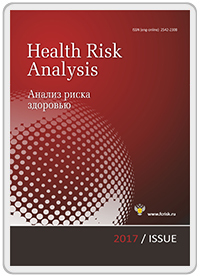 O sanitarno-jepidemiologicheskoj obstanovke v Respublike Severnaja Osetija-Alanija v 2014 g [On the sa-nitary-epidemiological situation in the Republic of North Ossetia-Alania in 2014]. Vladikavkaz, 2015. Available at: http://15rospotrebnadzor.ru/upload/document/1375867985.pdf (15.06.2016) (in Russian). Metel'skaya V.A., Gumanova N.G., Perova N.V., Oganov R.G. Oksid azota: rol' v reguljacii biologicheskih funkcij, metodjopredelenija v krovi cheloveka [Nitric oxide: role in the regulation of biological functions, the me-thods of determination in human blood]. Laboratornaja medicina, 2005, no. 7, pp. 19–24 (in Russian). Otiev M.A., Dzugkoev S.G., Mozhaeva I.V. Biohimicheskie markery disfunkcii jendotelija na fone jekspo-zicii hloridom kobal'ta v jeksperimente u krys [Biochemical markers of endothelial dysfunction at the exposure to cobalt chloride in the experiment in rats]. Zdorov'e i obrazovanie v XXI veke, 2017, vol. 17, no. 3, pp. 67–71 (in Russian). Dzugkoev S.G., Mozhaeva I.V., Gigolaeva L.V.,Takoeva E.A., Dzugkoeva F.S., Margieva O.I. Sistemnyj okislitel'nyj stress i biohimicheskie markery povrezhdenija vnutrennih organov [System oxidative stress and biochemical markers of the damage of internal organs]. Fundamental'nye issledovanija, 2014, no. 7-3, pp. 478–481(in Russian). Аsakаwа T., Mаtsushitа S. Cоlоring cоnditiоns of thiоbarbituric аcid tеst, fоr dеtеcting lipid¬hyd11rо¬perо-xides. Lipids, 1980, vol. 15, pp. 137–140. Böger R.H., Bode-Böger S.M. The clinical pharmacology of L-arginine. Annu Rev Pharmacol Toxicol, 2001, vol. 41, pp.79–99. Sultana C., Shen Y., Johnson C., Kalra V.K. Cobalt chloride-induced signaling in endothelium leading to the augmented adherence of sickle red blood cells and transendothelial migration of monocyte-like HL-60 cells is blocked by PAF-receptor antagonist. J. Cell. Physiol., 1999, vol. 179, pp. 67–78. Wagner M., Klein C.L., Kleinert H., Euchenhofer C., Forstermann U., Kirkpatrick C.J. Heavy metal ion induction of adhesion molecules and cytokines in human endothelial cells. The role of NF-kappaB, I kappaB-alpha and AP-1. Pathobiology, 1997, vol. 65, pp. 241–252. Baudry N., Danialou G., Boczkowski J., Vicaut E. In vivo study of the effect of systemic hypoxia on leu-kocyte-endothelium interactions. Am. J. Respir. Crit. Care. Med., 1998, vol. 158, pp. 477–483. Krantz S.B. Erythropoietin. Blood, 1991, vol. 77, pp. 419–434. Miranda KM, Espey MG, Wink D. A rapid, simple spectrophotometric method for simultaneous detection of nitrate and nitrite. Nitrtic Oxide: Biol & Chem, 2001, no. 5, 62–71. Peters K., Schmidt H., Unger R.E., Kamp G., Pröls F., Berger B.J., Kirkpatrick C. Paradoxical effects of hypoxia-mimicking divalent cobalt ions in human endothelial cells in vitro. Molecular and Cellular Biochemistry, 2005, vol. 270, no. 1, pp. 157–166. Van Hinsbergh VW: Regulatory functions of the coronary endothelium. Mol. Cell. Biochem., 1992, vol. 116, pp. 163–169.